Previous research has shown that surgeons’ intraoperative non-technical skills are related to surgical outcomes. The aim of this study was to evaluate the reliability of the NOTSS (Non-technical Skills for Surgeons) behavior rating system. Based on task analysis, the system incorporates five categories of skills for safe surgical practice (Situation Awareness, Decision Making, Task Management, Communication & Teamwork, and Leadership). Consultant (attending) surgeons (n = 44) from five Scottish hospitals attended one of six experimental sessions and were trained to use the NOTSS system. They then used the system to rate consultant surgeons’ behaviors in six simulated operating room scenarios that were presented using video. 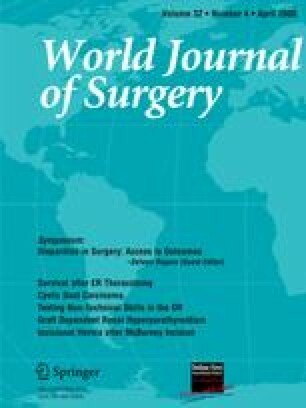 Surgeons’ ratings of the behaviors demonstrated in each scenario were compared to expert ratings (“accuracy”), and assessed for inter-rater reliability and internal consistency. The NOTSS system had a consistent internal structure. Although raters had minimal training, rating “accuracy” for acceptable/unacceptable behavior was above 60% for all categories, with mean of 0.67 scale points difference from reference (expert) ratings (on 4-point scale). For inter-rater reliability, the mean values of within-group agreement (r wg) were acceptable for the categories Communication & Teamwork (.70), and Leadership (.72), but below a priori criteria for other categories. Intra-class correlation coefficients (ICC) indicated high agreement using average measures (values were .95–.99). With the requisite training, the prototype NOTSS system could be used reliably by surgeons to observe and rate surgeons’ behaviors. The instrument should now be tested for usability in the operating room. The NOTSS system was developed under funding from the Royal College of Surgeons of Edinburgh and NHS Education Scotland. The views presented are those of the authors and should not be taken to represent the position or policy of the funding bodies. The authors thank the surgeons who took part in this study. A 62-year-old obese man with symptomatic gallstones is about to undergo emergency laparoscopic cholecystectomy. The patient is in the operating room and has been anesthetised. The surgeon arrives late and does not appear to know the patient. There are no long ports in the operating room or day surgery, so the surgeon decides to operate with short ports instead, exposing the patient to risk. A 69-year-old woman is undergoing a foot operation. The surgeon appears to be in control but does not communicate with the rest of the team (radiographer, trainee surgeon). He experiences technical difficulties with a drill. A 51-year-old man is undergoing elective mesh repair of an inguinal hernia. The consultant surgeon is bad-tempered, breaks operating room protocol, and openly questions the competence of operating room team members in a hostile manner. An 86-year-old woman is undergoing a trial reduction of femur. The consultant surgeon tells the trainee to be careful but is chatting with another team member when the trainee breaks the patient’s femur. The consultant surgeon blames the trainee and is initially aggressive, but rapidly regains control of the situation. A 40-year-old man has been anesthetized and is about to undergo repair of an inguinal hernia. A junior member of staff has taken the patient’s consent for the operation, and there is confusion over which side should be operated on. The trainee surgeon is keen to proceed and is sure that it is the left side, but the consultant surgeon decides to stop the operation and wake the patient up to make sure, involving other team members in the decision-making process. A 68-year-old woman is undergoing a knee replacement. The consultant surgeon treats the trainee and scrub nurse differently—he is friendly and encouraging with the trainee and not very communicative with the nurse. She makes a minor error as a direct result of the surgeons’ ambiguous communication style.